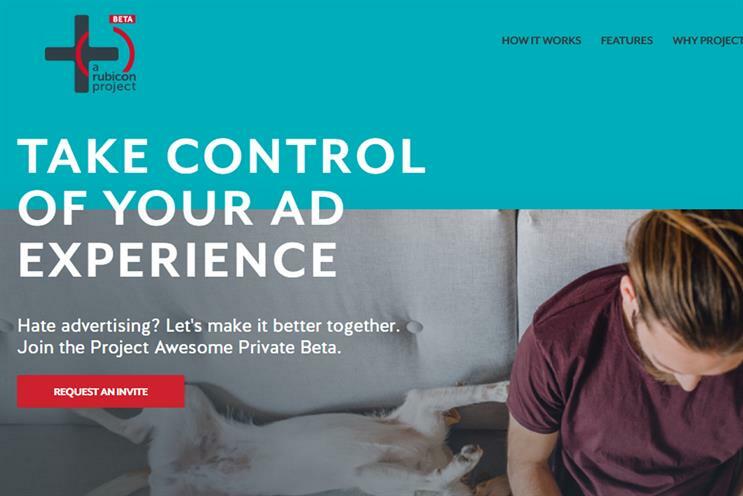 Advertising network Rubicon Project is launching Project Awesome, a consumer solution that allows users to actively control which types of ads they receive online, and how they receive them. Rubicon Project said that users of the platform would be able to give real-time feedback on ads, create profiles of their personal interests – which can be done in one minute – and like and dislike categories of ads and specific creatives. It would then use Rubicon Project’s machine learning technology to adapt and hone an individual user’s advertising experience based upon the data received. Users will be able to "snooze" specific ads, ensuring they do not see them again for a set period of time, and block them permanently. Rubicon Project cited a recent study carried out by Adobe, in which 78% of consumers said they liked personalised ads, but only 28% thought ads targeted to them were tailored correctly. Frank Addante, chief executive and founder of Rubicon Project, said the solution, which initially launches as a private beta, was aimed at creating an alternative to the "all or nothing" nature of ad blockers. He said: "Our vision is to turn advertising into information and provide information as a service to consumers. "There have always been three participants involved in advertising and for too long our industry has focused on the buyers and sellers and ignored consumers and their experience. The increasing adoption of ad blockers, privacy concerns and general apathy for ads, are symptoms of this lack of focus on the consumer experience. "People recently have been given a choice with ad blockers, but their choice has been limited to either see all ads or block all ads. That’s not ideal for consumers, advertisers or publishers and application developers."